“I want to tell you a little more about centres which will help you to understand the situation. Some centres are divided into two halves— positive and negative. This division is very clear in the intellectual and the instinctive centres. In the intellectual centre it is ‘yes’ and ‘no’, affirmation and negation. All the work of the intellectual centre consists of comparing. The division in the instinctive centre is quite plain: pleasure—pain. All instinctive life is governed by this. At a superficial glance it seems that the emotional centre also consists of two halves— pleasant and unpleasant emotions. But it is not really so. All our violent and depressing emotions and, generally, most of our mental suffering has the same character—it is unnatural, and our organism has no real centre for these negative emotions; they work with the help of an artificial centre. This artificial centre—a kind of swelling—is gradually created in us from early childhood, for a child grows surrounded by people with negative emotions and imitates them. Q. Are instinctive emotions not negative? Extract from ‘The Fourth Way’, P.D. Ouspensky. 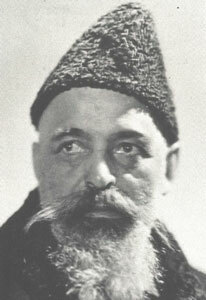 Gurdjieff was born in ca.1877 in Alexandropol in the Southern Caucasus, during the Russo-Turkish war. He was born into a troubled world: before the time of the Russian Revolution and World War 1. 1 – probably acting as a Russian agent. 2 – Being in pursuit of access to various monasteries and lamaseries in search of hidden knowledge. Apparently, he was so badly wounded that he lay unconscious for several days and took months to recover, taking refuge in a cave. His second encounter with a ‘stray bullet’ was in 1904 in the very early stages of the Russian Revolution, in the neighbourhood of the Chiatur Tunnel in Transcaucasia. Again there are beliefs that he was a revolutionary and government agent. Because of the disasters from 1902 onwards the world collapsed. Two World Wars and 40 million lives lost – not to mention the loss to human societies and cultures. Gurdjieff witnessed the waste-less flow of war and death and he set himself a task of finding out how to help people free themselves from destructive influences. This was in 1907 and represented a dramatic departure from his earlier objective of gaining knowledge and power for personal benefit. This change was most likely due to the compassion aroused in him by his growing awareness of the dilemma of modern man. He saw man’s need to dominate and destroy nature increasing side by side with a progressive decline in self-discipline and a loss of inner freedom. Gurdjieff seeing this state in modern man describes it as ‘The Terror of the Situation’. Man had ceased to function as an integrated whole and had lost direction and purpose. The ‘terror of the situation’ described by J.G. Bennett in 1973 in his book ‘Making a New World’ , says that we face the threat of population explosion, food shortage, exhaustion of resources, pollution and the revolt of the deprived millions. All these factors carry an incredible tension – the type of tension that can make wars, and this doesn’t embrace the threat from the ‘war-machine-technology’ and the nuclear power. And yet I had been certain from previous talks that he would answer, ‘No. it cannot’. ‘But the whole thing is How?’ he said. ‘It is necessary to know a great deal in order to understand that.’ ‘What is war? It is the result of planetary influences. Somewhere up there two or three planets have approached too near to each other and tension results. Have you noticed how, if a man passes quite close to you on a narrow pavement you become all tense? The same tension takes place between planets. For them it lasts, perhaps a second or two. But here on the earth, people begin to slaughter one another, and they go on slaughtering maybe for several years. It seems to them at the time that they hate one another, or perhaps, that they have to slaughter each other for some exalted purpose, or that they must defend somebody or something and that it is a noble thing to do; or something else of the same kind. They fail to realize to what extent they are mere pawns in the game. They think they signify something.’” (Extract from pages 23-25). But surely those who realize this can do something? If a sufficient number of men came to a definite conclusion that there should be no war, could they not influence others? Gurdjieff: ‘Those who dislike war have been trying to do so almost since the creation of the world and there has never been such a war as at present (1919). Wars are not decreasing they are increasing and war cannot be stopped by ordinary means. All these theories about Universal Peace and Peace Conferences are people striving towards an ‘ideal’ – but have these people mastered the impulse of destruction within themselves?. War has many causes that are unknown to us. Some causes are in men themselves others are outside of them. One must begin with the causes that are in man himself. How can he be independent of the external influences of great cosmic forces when he is the slave of everything that surrounds him? If he becomes free from this he may become free from planetary influences.’” (Extract from ‘In Search of the Miraculous’ page 103). “‘Let us take some event in the life of humanity. For instance, war. There is a war going on at the present moment. What does it signify? It signifies that several millions of sleeping people are trying to destroy several millions of other sleeping people. They would not do this if they were ‘awake’. ‘How many times have I been asked whether wars can be stopped? Certainly they can. For this it is necessary that people should awaken. It seems a very small thing but it is very difficult because everywhere this sleep is induced and maintained by the whole of surrounding life and conditions. ‘There is nothing new in the idea of sleep. People have been told almost since the creation of the world that they are asleep and they must awaken. How many times is this said in the Gospels for instance?’Awake’;’Watch’;’Sleep not’. Christ’s disciples even slept when he was praying in the Garden of Gethsemane for the last time. It is all there but men do not understand. They cannot accept the fact that they are asleep.” (Extract from ‘In Search of the Miraculous’ page 143/144). Christianity forbids murder. Yet all that the whole of our progress comes to is progress in the technique of murder and progress in warfare. How can we call ourselves Christians? No-one has a right to call himself a Christian who does not carry out Christ’s precepts. A man can say that he desires to be a Christian if he tries to carry out these precepts. But we can only show our attitude by our actions. “Where there is no vision people die. Today (1946. ) when vision is ceasing, the power of external life, of machines and war increases. Humanity is becoming enslaved by outer life, because it has no inner life. Having given up on the idea of religion it has nothing with which to resist outer life. Man becomes helpless – a creature of mass movements; mass-politics; and of gigantic mass-organisations’. (page 865, Psychological Commentaries). People say: What is war? Why should war be? Does God will war? If God wills war, can he be a God? These bind us to ‘thought systems’ offering only an ‘ideal’. The Fourth Way teaches us to value the potential for our own growth as individuals. It is a system offering knowledge, understanding, and a way which is essentially practical; a system for helping us to ‘know ourselves’ and to develop within us the strength to not only observe but also to contain our own propensity for violence. We strive to hold negative emotions and the seeds of violence in our nature so that our emanations are rendered harmless to ourselves and to others. We strive for growth of Essence. “I set before you this day life and death, blessing and cursing. Compiled by a group member.